Once stretching from Vienna in the north to Iraq and Yemen in the south, the Ottoman Empire has played an integral role in the history of Eurasia and the Middle East. The dynamics and complexity of the present-day Middle East and Balkans cannot be understood without an examination of the history of the Ottoman Empire that ruled these regions for centuries. Encyclopedia of the Ottoman Empire provides a thorough overview of the history and civilization of the Ottomans, with more than 400 A-to-Z entries focusing on major events, personalities, institutions, and terms. With signed articles by experts in the field, this comprehensive one-volume resource also includes essential information regarding imperialism and the emerging Balkan, Arab, and Turkish nationalism; the demise of the empire; and Ottoman legacy in the Balkans and the Middle East. Further readings, approximately 85 black-and-white photographs and maps, cross-references, a chronology, glossary, bibliography, and an index complement the text and give readers an in-depth understanding of the broad and fascinating history of the Ottoman Empire. "This is the most important reference work available in English about one of the greatest and most splendid empires in history." "...an invaluable and enthusiastically recommended addition to personal, academic, and community library World History reference collections and supplemental reading lists." 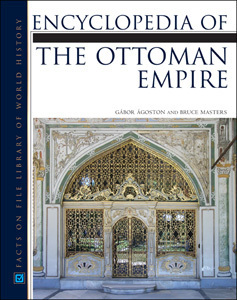 "Impressive in scope and expertise..."
"...an excellent overview of the rise and decline of the Ottoman Empire...a practical and easy-to-use reference resource...recommended for high school and academic libraries." "...a splendid encyclopedia...Students and scholars alike will welcome the depth and thoroughness of this encyclopedia. Highly recommended for all college and university libraries as well as larger public libraries...a fine example of how to put together an encyclopedia."